Following his execution on December 30, the remains of Saddam Husayn were turned over to the shaykh of the Albu Nasir tribe. The shaykh was moved by American military aircraft from Tikrit to Baghdad where he took custody of the body for return to Saddam's family burial plot in 'Awja, the village of his birth located about eight miles east of the city of Tikrit. A funeral service was be held at the burial site on the morning of December 31. Following that, Saddam will be laid to rest about two miles from the graves of his two sons, 'Uday and Qusay, killed by U.S. forces in a gun battle in Mosul in July 2003. The location of the sons' graves are well-known, but are not marked. To ensure that no memorials are erected by supporters, or that the bodies are not desecrated by others, the area is patrolled regularly by American troops. The movement of Saddam's remains to 'Awja are in direct contradiction of the wishes of Saddam's eldest daughter, Raghda (age 39). She wanted the remains moved to Yemen for temporary burial until Iraq is "liberated." After she realized that was not going to be permitted, the family, acting in accordance with Saddam's last will and testament, asked that he be buried in Ar-Ramadi, a town known for its high level of insurgent activity. 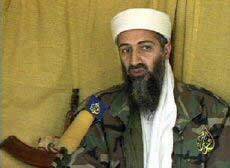 According to the family, Saddam had indicated that he wanted to be buried in 'Awja or Ar-Ramadi. Why was Saddam's tribal shaykh moved by the U.S. military, why was Saddam afforded a funeral, and why were his daughter's wishes ignored? 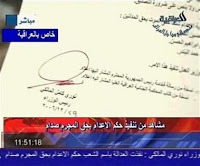 I suspect that prior to the signing of the execution warrant (see photo), a deal was struck between Prime Minister Al-Maliki and senior Sunni political leaders (possibly Vice President Tariq al-Hashimi, regarded as a moderate) that a funeral would be permitted and the remains would be transported to 'Awja for burial. This is unlike the treatment afforded the remains of Al-Qa'idah in Iraq leader Abu Mus'ab Az-Zarqawi who is buried in an unmarked grave in an undisclosed location. A deal such as this might have been an attempt to assuage the anger and humiliation of Sunni politicians, many of whom regard the entire trial, sentencing and appeal process as rigged by the Americans and rushed to execution by the Shi'a-dominated government. 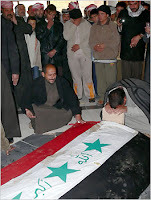 On a trivia note, the flag used to cover the coffin is the Saddam era flag. The green script between the three stars are the Arabic words allahu akbar (God is great). The two words were added by Saddam following his invasion of Kuwait in 1990 after he realized that he was facing a multinational military force intent on removing his forces from Kuwait. The addition of the Islamic phrase was an attempt to wrap his regime and actions in the mantle of Islam. On the original "Saddam flag," the words appear in script said to be Saddam's handwriting. The current Iraqi flag retains the phrase, but in a different font. It's not usual for us to send readers to other blogs -- sisterly or not -- on such a regular basis, but this is a fantastic read from Lt. Col. Rick Francona, a regular Hardblogger contributor and former CIA operative. In this piece, Francona writes about his covert work in 1996 to overthrow Saddam Hussein. Three sons of an Iraqi general Francona was working with were captured and killed, so the execution of Hussein has very personal meaning for him. 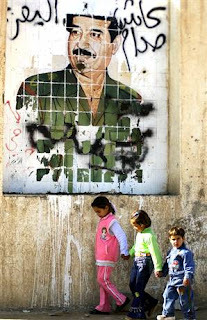 Saddam Hussein’s rule affected virtually everyone in Iraq. Everyone has a story. 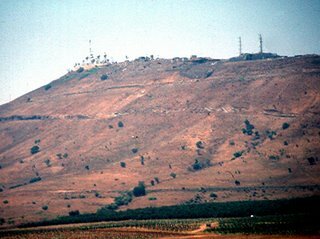 In 1995 and 1996, I was involved in the CIA’s covert operations to overthrow Saddam Hussein, operating from several Middle East countries bordering Iraq, as well as inside the Kurdish-controlled area of Iraq itself. One of these operations was to support of the Iraq National Accord (INA) under Dr. Iyad Alawi. One of Alawi’s key colleagues was a retired Iraqi military officer, General Muhammad Abdullah Al-Shahwani. Al-Shawani had relocated outside Iraq, but his three sons were serving in the Iraqi Army Republican Guard. General Al-Shahwani was in contact with his sons and others in the Iraqi military; together they planned a coup to overthrow Saddam Hussein. By mid-1996, we believed that a coup had a chance of success. We began the infiltration of Iraqi agents we had recruited and trained to support the coup attempt. Unfortunately, one of the agents was detected inside Iraq. Under severe interrogation, he revealed what information he knew and the whole operation was compromised. Iraqi security officials arrested virtually everyone involved in the coup attempt; most were executed. As part of the team working directly with Al-Shahwani, I spent a lot of time at his home. I was with the general and his wife when word came that their three sons had been arrested. I was with them when one of their sons was allowed to make a phone call to his mother just prior to his execution. I told Mrs. Al-Shahwani that someday Saddam would pay for his crimes. Finally, that day is here. Despite some misconceptions in today's news reports, Iran is not running out of oil - they have between 131 and 138 billion barrels of proved oil reserves, depending on what source you use. However, their revenues from oil exports are in decline, by as much as 10 percent per year. There are several reasons for this decline, mostly of the government's own making. Over the last few years, they have been pouring immense amounts of money into weapons programs, both conventional and nuclear. These programs include longer range ballistic missiles, cruise missiles, high-speed torpedoes, naval combatants, etc., in addition to the now famous nuclear weapons program. All these research and development programs are expensive. Money needed for improvements in the oil sector are being diverted to these programs. Iran responds that U.S. sanctions that punish companies that deal with Iran hurt their ability to spend money on the oil sector. Other factors impacting Iran's oils exports are domestic demand and lack of refining capability. Domestic demand is skyrocketing, cutting into the amount of oil that can be exported. Iran does not refine enough gasoline and diesel to satisfy domestic requirements - about 40 percent of it must be imported. Sanctions imposed by the United Nations Security Council Resolution 1737 may not be strong, but if Iran does not comply by suspending uranium enrichment, more stringent sanctions are likely to follow. This will only exacerbate the declining oil revenue situation. Many analysts believe that the declining revenues, sanctions, internal political unrest and rampant poverty in a country with the second largest oil reserves in the world will bring about internal regime change if left alone. The problem is the time line. It may take five years for these issues to come to a head. Iran may have a deliverable nuclear weapon in less that three years. Is the world willing to wait? Saddam Husayn has exhausted the appeals of his death sentence. An Iraqi appeals court upheld the death sentences for Saddam, former head of the dreaded Iraqi Intelligence Service (al-mukhabarat) Barzan Al-Tikriti (Saddam's half brother) and former revolutionary court judge 'Awad Ahmad Al-Bandar. According to Iraqi law, the judicial process for this case is complete. The three, along with three other defendants, were found guilty of crimes against humanity. The specific crimes were the deaths of almost 150 Shi'a Iraqis in the village of Al-Dujayl after a 1982 assassination attempt against Saddam. Since crimes against humanity are international crimes, the verdict is not subject to presidential pardon. Iraqi law is very specific on carrying out the sentence. The three must be executed by hanging within 30 days, after the sentence is ratified by the Iraqi president, Jalal Talabani. Talabani is personally opposed to the death penalty, so will have one of the vice-presidents ratify the sentence. The sentence is to be carried out regardless of other ongoing judicial proceedings - the current trial for crimes against the Kurds in the Anfal campaign should not interfere with the executions. 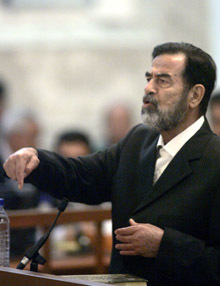 Iraqi officials have stated in the past that they want to continue the series of trials against Saddam in order to make sure all of his misdeeds are made public. Saddam has asked that he be executed by firing squad, but Iraqi law again is specific - executions are by hanging. Although there were calls for it to be done in public, security concerns will likely force it to be a private procedure on an American compound. No doubt the execution will further inflame the Sunnis and may lead to increased violence directed at American and Iraqi forces, as well as the general Shi'a population. That said, it needs to be done. Several human rights, including Amnesty International and Human Rights Watch, have criticized the judicial process of the trial, as well as the death sentence. Where were they when Saddam was killing 400,000 Iraqis? On December 23, the United Nations Security Council (UNSC) unanimously passed Resolution 1737, imposing sanctions on Iran for its continued refusal to suspend its uranium enrichment activities as required by UNSC Resolution 1696 (July 31, 2006). The resolution states that if Iran does not comply within 60 days, additional sanctions may be applied. The resolution was not as strong as the United States would have liked, but to gain Russian acceptance, it agreed to less stringent sanctions. The final draft was also acceptable to Qatar, who was the lone vote against Resolution 1696 in July. Now that there is a sanctions regime, albeit weak, in place, it will be difficult for the Russians to object to stronger sanctions if Iran does not comply with the requirements of the resolution. "I am sorry for you who lost the opportunity for friendship with the nation of Iran. You yourself know that you cannot damage the nation of Iran an iota. You have to accept that Iran has the technology of producing nuclear fuel. This will not damage the nation of Iran, but its issuers will soon regret this superficial and nil act." "We are not obliged and it is not expected that cooperation with the IAEA continues at the same former level." "The government should seriously and strongly continue the important issue of peaceful nuclear technology with prudence and foresight. It should never accept such illogical pressures. Death to America." "We are now more decisive in realizing our nuclear aims. From Sunday morning, we will begin activities at Natanz — site of 3,000-centrifuge machines — and we will drive it with full speed. It will be our mmediate response to the resolution." "The same Governments, which have pushed this Council to take groundless punitive measures against Iran's peaceful nuclear program, have systematically prevented it from taking any action to nudge the Israeli regime towards submitting itself to the rules governing the nuclear non-proliferation regime." Will sanctions be effective? Iran's defiance would tend to indicate that they will not. They believe that their huge oil reserves and the world's seemingly insatiable thirst for oil will insulate them from the effects of sanctions - they may be right. If sanction prove to be ineffective, is military action inevitable? Several Israeli leaders believe that may be the only option. Additionally, the chances of constructive dialog with the government in Tehran, as recommended by the Iraq Study Group, have been dealt a severe blow. No surprise - I still maintain that Iran is part of the problem, not part of the solution. See my earlier piece for MSNBC's Hardball, Iraq Study Group - Iran and Syria part of the problem. Senator Nelson in Damascus - what are you thinking? On December 13, Florida senator Bill Nelson met with Syrian president Bashar Al-Asad in Damascus. This comes at a critical time for U.S. policy in the region, and Nelson's meddling is not helpful. Nelson sits on both the Senate Armed Services and Foreign Relations committees, but this does not make him the Secretary of State. So here we have a powerful and influential Democrat meeting with the leader of a country that not only openly supports Hizballah in Lebanon and Hamas in the Palestinian territories, but is one of the leading supporters of the insurgency in Iraq and a close ally of the world's major state supporter of terrorism, Iran. Instead of allowing the U.S. government to speak with one voice - via the executive branch, which is charged with conducting foreign policy - we have "Wild Bill" off mucking up the waters with one of the countries that is part of the problem, not the solution. After the meeting, Nelson held a press conference. This is standard procedure for these visits. I served at the U.S. Embassy in Damascus in the 1990's and assisted in many of these Congressional shopping trips - wonder why they always come at Christmas time? The press conference is a tremendous legitimizing event for the Syrian regime. It allows the Syrians to portray themselves to the world that they are a regional player and that American officials seek their counsel. I am sure the merchants in the Al-Hamidiyah bazaar (one of the best in the world) appreciate Nelson's efforts. But wait - there's more. Even more senators are going to Damascus shortly - John Kerry, Christopher Dodd and Arlen Specter. More photo opportunities for the Syrian regime, more money for the Syrian merchants. So, what was the result of Nelson's ill-advised visit? According to the senator, Al-Asad indicated "a willingness to cooperate" in better controlling the Syrian-Iraqi border. Nelson passed that startling revelation on to embassy officials, who you can bet were thrilled that he was able to take time from his busy schedule so close to the holidays to help out with our foreign policy. Where do we find such men? Of course Al-Asad said whatever the senator wanted to hear - is anyone surprised by this? Nelson's boondoggle comes at an inopportune time, following the release of the Iraq Study Group's inane recommendation that we engage Iran and yes, Syria, in a "diplomatic offensive" to help us with the war in Iraq. (Read my earlier article, Iraq Study Group - Iran and Syria part of the problem.) Visits such as these only confuse the issue at a time when the United States needs to be speaking with one voice. Next time, Bill, shop at home. Iran and Syria are part of the problem, not the solution. The Iraq Study Group released its report today after nine months of meetings, interviews and travels. The bottom line is a recommendation that the United States transition its force structure in Iraq from one of primarily combat forces to one of a military training mission, while at the same time diplomatically engaging Iran and Syria. The report also concludes that a solution to the Arab-Israeli problem is essential to achieving American goals in the region. There does not appear to be anything new here, nor has anything especially prescient – this is what been leaked over the past few weeks. Much of what the study group recommends is already in progress. Senior military officers have advocated increased training of Iraqi security forces – police, army, border forces, etc - for the last two years. In fact, the primary focus of the last year has been a new emphasis on training the Iraqis. This has always been part of the plan: as Iraq forces become more capable, American combat forces can withdraw – and only then. Probably the most contentious of the recommendations is the call for a “diplomatic and political offensive” engaging regional players, including Iran and Syria. Iran and Syria are part of the problem, not part of the solution. Expecting these regimes to stop actively working against the American presence in Iraq and now assist the United States government to achieve its goals in Iraq is pretty far-fetched. Will the Iranian and Syrian governments agree to talk about Iraq? Certainly – this legitimizes and rewards their unhelpful past behavior and partially achieves their objectives. Talks with them will be on their terms - they will be happy to take whatever action hastens the withdrawal of American forces in defeat. The recommendation to talk to the Iranian government is sure to set off alarm bells in Tel Aviv. Israeli leaders on all sides of the political spectrum remain convinced that Iran poses an “existential threat” to the state of Israel. They fear American negotiations with Tehran over the situation in Iraq may weaken American resolve on Iran’s suspect nuclear weapons program. I don’t think anyone believes that the current strategy in Iraq is working. The study report will hopefully convince the President that his current strategy in Iraq has failed. Changes – major shifts in strategy - are necessary and coming. That said, negotiating American foreign policy with Iran and Syria is not a good course of action. I was recently interviewed by Philip Dine of the St Louis Dispatch about the upcoming Baker study group report. WASHINGTON — A "stay-the-course" U.S. policy in Iraq has suddenly veered toward a "change-the-course" posture, but with little certainty about what it will be changed to. After three years of repeated insistences by President George W. Bush that he would accept nothing short of victory in Iraq and that the proper policy was in place to achieve that end, everything appears up in the air amid an intense flurry of new studies and proposals about the war. Which of the recommendations the White House will adopt is unclear, but rising public anger over the war reflected in the congressional elections has most observers believing the administration has little choice but to shift gears. "They're looking for a way out," Rep. Ike Skelton, D-Mo., said of the administration. The most widely anticipated recommendations are those of the bipartisan Iraqi Study Group, led by former Secretary of State James Baker and former Rep. Lee Hamilton, expected early next month. "The Baker-Hamilton commission may come up with something," said Skelton, who will be the new chairman of the House Armed Services Committee. "My guess is (the White House) will embrace all or part of it and head for the door. They lost the election on this issue, and it's resonating in the administration." Loren Thompson, chief operating officer of the Lexington Institute who has close ties to many Pentagon officials, agrees that the White House understands it needs help. He said Bush would love to get a realistic plan for victory but would accept a graceful way out of Iraq. "The Bush administration would very much like some sort of silver-bullet solution to the Iraq dilemma," Thompson said. "However, it will settle for any reasonable pretext that allows a reduction in the American presence." Skelton came closer than he ever has to saying the United States already has lost the war. "The biggest disappointment to me is we have not won the hearts and minds of the Iraqi people," he said in an interview. "That's the bottom line. And the situation keeps getting worse. You say to yourself, 'How can it get worse? ', and it is." and Syria into a regional conference to discuss Iraq's future. Meanwhile, more ideas — and pressure — will be coming from other quarters in the next few weeks. — The new Democratic leaders of Congress are pushing for a redeployment of troops in four to six months or sooner. — Gen. Peter Pace, chairman of the Joint Chiefs of Staff, is doing his own study of Iraq policy. — Secretary of State Condoleezza Rice delayed a trip to Asia to brainstorm on Iraq. — British Prime Minister Tony Blair, a key Bush ally, now is calling for a shift in Western policy on the Middle East, including trying to bring in Iran as a partner. — Confirmation hearings next month for Robert Gates as the new defense secretary will spark more proposals on Iraq, and the White House is conducting an internal review of Iraq policy. What gives these initiatives significance is that a White House that once criticized anyone who questioned U.S. policy in Iraq as aiding the terrorists is now on the defensive. After Bush and his top aides met last week with Baker's panel, White House spokesman Tony Snow denied that Bush wanted to "outsource Iraq to the Baker group," but he acknowledged that because the United States was in a "tough position" in the war, ideas were welcome — and needed. The key questions are whether the administration is open to a major shift in policy, and whether the United States has any room to maneuver at this point. Some analysts suggest that the White House's doing its own review of policy is aimed not at countering the Baker panel but rather at allowing the administration to say that if it makes changes it isn't merely following the recommendations of others. Skelton said he intended to push for two immediate alterations in policy. The first will be redeployment of some troops out of Iraq within a month. "We have to let the Iraqis know, and let the American people know, that the Iraqis are going to have to protect themselves, and that's the only way they can save their country," he said. Secondly, the mix of U.S. forces training Iraqis has to change, Skelton said. "You need Special Forces to do that, because that's what they do in life — they train other cultures." While insisting that Bush would not change his definition of victory, Snow acknowledged that the current strategy was not working "fast enough." As a result, Snow said, "If there's a proposal to help the Iraqis defend themselves, he's open to it." But that may be tough to find, says Richard Haass, president of the Council on Foreign Relations and former director of policy planning for the State Department in Bush's first term. "I'm not sure there are any good options," Haass said, adding that rather than "succeeding in Iraq," more realistic talk now is about "reducing our losses there." What boxes the administration in, he said, is that the public wants neither "more of the same" nor a hasty retreat. Whereas U.S. officials have long touted the goal of training more Iraqi troops to stabilize the country, that's becoming problematic as sectarian strife grows. In a sense, Haass said, training Iraqi forces builds armed groups that are "more loyal to a regional leader or religious sect than to Iraq as a country." What might end up happening, he said, is that U.S. forces will be shifted to advisory roles and away from fighting. On the diplomatic front, it might be necessary to pull together "a forum involving all of Iraq's neighbors, including Iran and Syria," Haass said; but dealing directly with Iran and Syria is an idea Bush has steadfastly rebuffed. Retired Lt. Col. Rick Francona, who conducted Middle East operations for the CIA and other agencies, said Bush's hope to find "a way to win" from the Baker commission was a long shot. Francona said he had heard that the panel was likely to recommend that Iran and Syria be brought in. He said this would prove "very hard for the president to do," because whenever Iran was mentioned in any context, Bush's immediate reaction was that it must stop its nuclear program. Even if Bush relented on that demand, Francona said, Israel strongly opposes any overture to Iran, citing Iran's threats about destroying the Jewish state. chairman of the Senate Armed Services Committee, strongly disagreed. He called for "a phased redeployment of our forces within four to six months." House Democrats' defeat Thursday of Rep. John Murtha, D-Pa., as their majority whip, may blunt the Democratic push to get out of Iraq quickly; he is the congressional Democrats' sharpest anti-war critic.